Home :: ForDogTrainers Continues Good tradition of Seasonal Photo and Video Contests. ForDogTrainers Continues Good tradition of Seasonal Photo and Video Contests. Another great opportunity to participate and win Amazing prizes is granted by ForDogTrainers company. 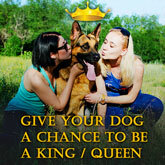 Winter Dog Photo and Video contest of International Scale has started. Everyone is welcome to show his/her precious doggy to the Entire World. The most creative and extraordinary photos are likely to win but that is for people to decide. A lot of efforts was exerted to make both these contests as transparent as possible. Only 'fair play' is possible. The entire world will see your doggie. If you think creative you have good chances to win. You get lots of exiting feelings wishing to win. You can participate in both contests or in only one of them if you prefer video making or photo shooting only. If you don't have friends among professional photographers it is not a problem because ForDogTrainers prepared useful tips how to make your content pro-like. You can find these dog photo shooting tips very useful and not less valuable dog video making tips. Just trust in your skills and your dog awesomeness and you are half way to the success! But some actions are also needed! Think about your ideas on photo shooting or video filming. Make your footage and select the best shots and videos according to your opinion. Upload them on the site and wait for the results! Engage all your friends to vote for your pet! Ask then to share links via social nets because nowadays this is the most powerful way to get recognition and likes! But don't cheat, play fair! The more pics and videos you share the better chances are for winning! The greatest advantage and difference of these contests from others are than the winner will be determined by the majority of likes per day! So, no matter when you start participating you have equal chances to win. So, don't wait up, make pics and films and upload them and see how your content is being voted! Good luck!